In transit, carrying two guitars can get awkward, yet having that second guitar on stage or in the studio is a real necessity for some players. Mono Cases provides elegant solution to make it easier for you to transport your guitars while ensuring each has the same protection given by their rugged M80 hybrid case. After a year of prototyping, the Z-form design was perfected (patents pending). The end result is an incredibly lightweight, extremely sturdy double-hybrid electric guitar case. The zigzag design of the Mono M80 multi-guitar case creates a completely separate case for each guitar. That means both headstocks are protected with the neckbrace and strap pin bumpers. 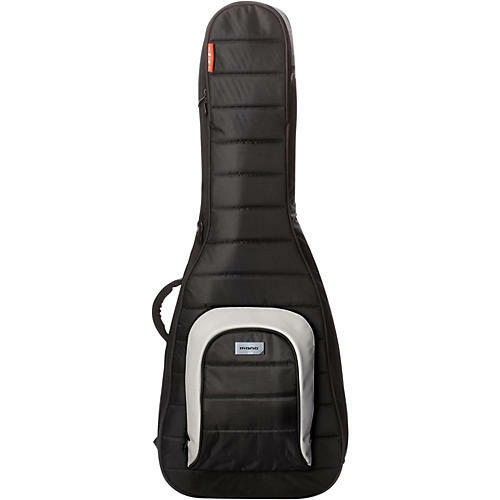 It also means the Mono M80 case can be used with 1 or 2 guitars-something you'll appreciate on the road. Additionally, the Z-form design allows for immediate access to either guitar. Grab one from the left side or the other from the right side. Mono Cases' innovative neckbrace design provides a level of protection worthy of the finest instruments. Your guitar quickly straps in and remains stabilized during transport. The headstock is suspended inside the case, saving the guitar from impacts that could otherwise snap the neck. Mono Cases builds their cases to military specs, using only high-test materials with extreme resistance to abrasion and the elements. Inside, the plush lining protects delicate custom finishes so your guitar rides first class while you launch an urban assault. With this Mono dual guitar case, everything is in its place. Specialized storage compartments put your gear right where you need it. Deep gussets make sure your small items stay put, and the hidden upper pocket keeps your wallet, keys, and cell phone concealed. The Mono M80 fits 2 standard body electric guitars including Fender Tele/Strat, Gibson, Les Paul, Ibanez, ESP. This product is covered under Mono Cases' 3-year limited liability warranty.